Mrs. Edith Ingels, 47, wife of Clyde L. Ingels of Corral de Tierra, passed away early Sunday morning at a local hospital after a lingering illness. 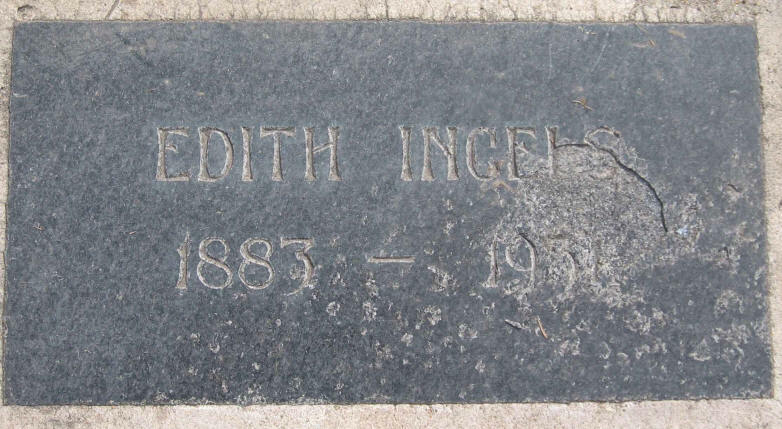 Mrs. Ingels, a native of New York City, came to the peninsula when a small child and was educated in Pacific Grove schools. She was a highly esteemed resident of this community, a charter member of the Monday club, and leaves a host of friends to mourn her loss. 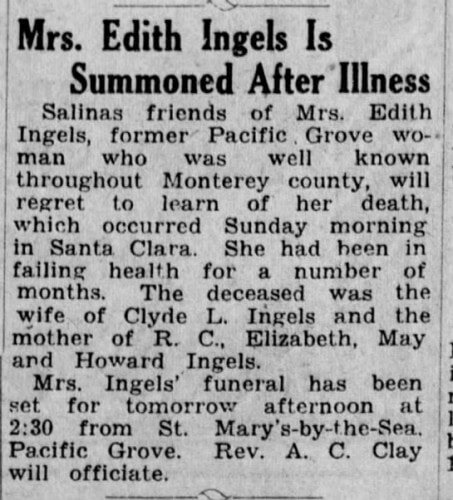 Beside her husband, she is survived by four children; Roland C. Ingels of Monterey, Miss Elizabeth Ingels of Pacific Grove, Miss Mary Ingels of Berkeley and Howard Ingels of Corral de Tierra. Funeral services will be held at 2:30 tomorrow afternoon in St. Mary's by-the-Sea Episcopal Church at Pacific Grove, with Rev. Albert E. Clay officiating. Interment will be in the Monterey Protestant cemetery. Freeman's undertaking company is in charge.